Price Drop! Was: $49.95 Now: $29.95. For a limited time only, while stocks last. 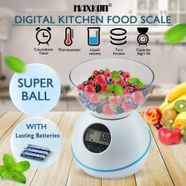 Measure out the portions of variety of foods and make your life easier with this digital multifunction kitchen scale which allows you to switch between units of measurement in grams, milliliters, ounces and pounds. Employing a high precision strain gauge sensor system, the digital scale is able to weigh from 1 gram to 5 kilograms with measurements in graduation of 1 gram (0.1 oz.). The smart LCD screen display with the included tare, thermometer and countdown timer function make each of weighing process quick and easy. Moreover, the removable food grade bowl allows for easy storage and cleanup. Designed with a ball shape in white colour, the electronic scale will surely add an elegant touch to your kitchen.